If you have that magic combination of wealth, lots of open space in your home, a non-existent or very understanding partner, and maybe a touch of agoraphobia, today's a great day. 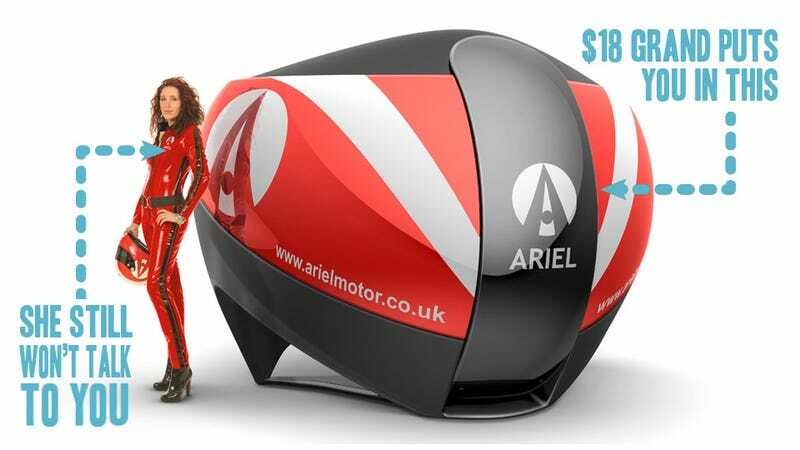 Ariel, makers of the skeletal Ariel Atom and simulator maker Motion Simulation have joined forces to produce what is likely the finest consumer-purchasable driving/flying/running-and-killing simulator available. The TL1 Simulator's shape is defined by its industry-first 180° spherical (really a spherical section) screen, giving a totally immersive experience. Multiple projectors combine to produce a seamless image at a resolution of 5760x1200 pixels (to compare, HDTV is 1920x1080) that entirely encompasses your field of vision. The seating is completely adjustable to mimic most common racing seating positions (touring, GT, formula) and includes actuators to vibrate and move the seat based on program input. The seat also can emulate seating positions for flight simulators as well. The entire unit can be dismantled to fit through a standard door (fun! ), and the company calls it "highly portable." Hm. Maybe if you're a wealthy Sasquatch. Controllers like a steering wheel and pedal assembly are included, and other controls can be used, too. An integrated PC specifically kitted out with powerful graphics cards is included, and runs Windows 7 or XP. That's great, because if you wanted to use this 180° immersive simulation pod for your Excel work, you can finally feel like you're inside the spreadsheet. Plus, think about the joys of immersive Solitaire! Based on the videos, this thing does look pretty amazing, and is likely the closest you can get to these experiences without safety equipment or even pants. At £11,500 ($18,657) it's certainly expensive, but in the realm of immersive simulators, it's not that bad. I suspect anyone with both enough room to have one of these and the resources to buy off their partner's approval won't find the money an issue. Where this could really get interesting is as a low-budget simulator for smaller auto and aerospace firms. Maybe we can take up a collection and get a Jalopnik-owned one, for our Jalopnik community to use! We can put it in my front yard– I even have a tarp!